Completed 2007. 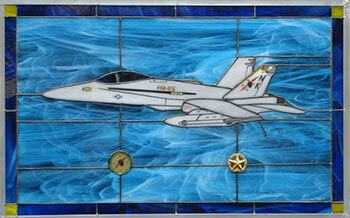 This panel was a gift to the Commander of VFA-25, ‘Fist of the Fleet’, by his wife, prior to the unit’s deployment aboard the USS Ronald Reagan. Plane 400 belongs to the squadron’s skipper. The design includes one of the actual Command Pins and the unit coin. A really neat ensemble!